As you know, the federal government can be fixated on Lowest Priced Technically Acceptable (LPTA) contracts, so cost-sensitivity is crucial when preparing a proposal, and knowing your true bottom line will help you price competitively. Having access to the EZGovOpps Labor Pricing module enables members to compare and contrast different government contractors by job title, keywords within those titles, keywords within the job description, all using robust Boolean search functionality. Members can target competition revenue ranges in combination with all of the above noted search criteria to isolate contractors in the same revenue range. With the ability to create custom charts based on this information, presenting ideal pricing strategies for your statement of work/proposals has never been easier. 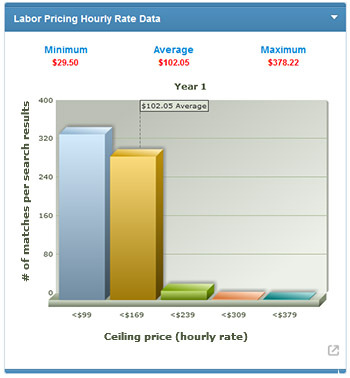 Example of a Labor Pricing graphic result for “Database Administrator”.